You prayed for God to open doors. Oh Stacy. So interesting that we both posted on waiting in prayer. Thank you so much for the quote from E M Bounds. He also said, "If you awake in the night and are unable to sleep; it is because God wants you to pray." I try to pray at night when I awake. We do just have to wait on God, persevering in prayer. Lovely, powerful post! Love that picture too! I hate waiting for any reason so the times I'm waiting on God seems eternal. Thank you for bringing this truth clear to me -- that God wants to know that we will remain faithful. Waiting is never a fun process, but it is during the waiting that we are given the opportunity to make wise choices. 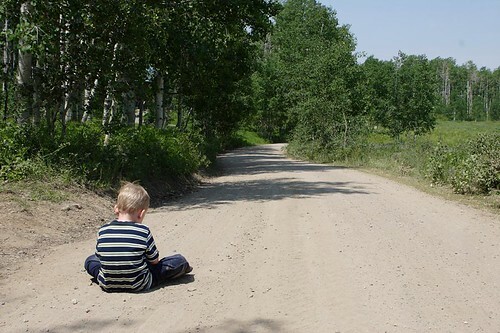 Sweet picture of the little boy in the road. Yes! It's in the waiting that our faith grows as we rely on Him and not ourselves. Great questions!